WASHINGTON (Sputnik) - US Representative Ilhan Omar in a statement issued after being sworn-in as the first woman to wear a Muslim hijab as a member of Congress said she would fight Trump administration efforts to divide the American public. "I plan to resist the current Administration's attempts to divide us and push destructive policies that chip away at our rights and freedoms," Omar said on Thursday. "We have the opportunity to build a more inclusive and compassionate culture, one that will allow our economy to flourish and encourage more Americans to participate in our democracy." With her first votes, the release added, Omar voted for Nancy Pelosi to serve as Speaker of the House and was also proud to vote on legislation to bring an end to the government shutdown and reject Trump's "hateful" border wall. Omar, together with Rashida Tlaib, both Democrats, were sworn in on Thursday as the first two Muslim women ever elected to Congress. Omar is also the first Somali-born American elected to Congress and the first African-American woman to represent the state of Minnesota. 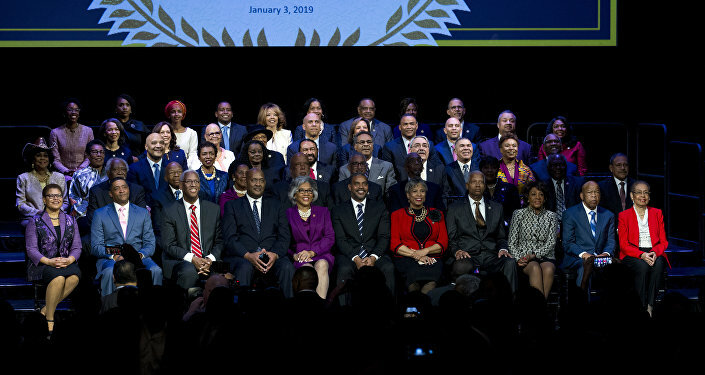 The 116th US Congress convened for the first time on Thursday where newly elected and re-elected members in both the House and Senate were sworn-in.